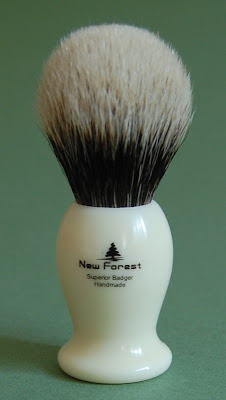 It has a superb two band badger knot of 22 mm, and it's the first New Forest brush. So it's the 2201.The loft of about 50 mm makes it an excellent all round brush that will handle both soaps and creams and your preferred method of lathering. The head is made of redressed and resorted long best badger hair. This hair is a bit stiffer than silvertip but has soft tips. 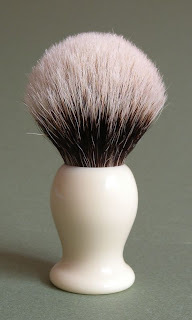 The length of the hair enables brushes to be made with only black and white bands showing above the handle. So it is commonly known as two band. Short or twisted hairs are removed, leaving the hair feeling soft and giving the brush a light appearance. The brush is firm at the base with good backbone but not stiff like some shorter lofted two bands, yet delightfully soft at the tips. The knot is hand made and the handle is lathe turned and hand polished.This is a fine example of the increasingly popular two band brush. At £25 it is simply the best value high quality brush you can buy. And just £2.00 for worldwide delivery. It's the brush you just have to try.